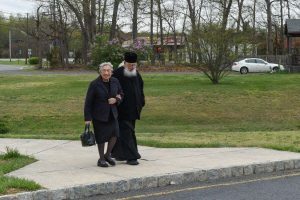 When visiting our parish for the first time, please remember that, regardless of whether or not you are an Orthodox Christian, we are very honored by your visit and happy to meet you. This is the most important thing. Matters of dress, church etiquette, and piety, while also important, should be understood to be secondary. Furthermore, the church building itself is often objectified, almost as if the building itself were alive. In a certain way it is, and we love our “church” and its appointments. Truly, we believe that God has sanctified this building. However, the building is not “the Church,” and if we were to lose it, the parish would not cease to exist. When you visit us, we are anxious to meet and receive you as our guest, so please stay long enough following the service so that we can do so. On your visit, you will note two things immediately. 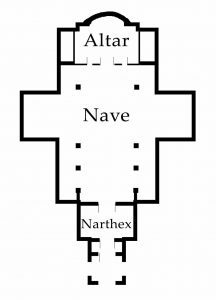 The first is that the church is divided into three distinct spaces, which are called the narthex (the first space where the candle counter is located), the nave (the centermost part of the church), and the altar, or sanctuary (where the Altar Table and Table of Oblation are located). The narthex was traditionally where catechumens and penitents would remain; in modern practice, it is where the exorcism prayers at baptisms are read, betrothals at weddings and churchings are performed, and where candles are sold. The nave represents the world, sanctified by God’s presence and the mighty acts He has performed for our salvation. For this reason, we see icons here celebrating the major feasts of the Church year and icons of various saints. The altar represents the Kingdom of God, and the Altar Table proper represents His Throne. Here the Mysteries, or Sacraments, of the Faith are celebrated, and from this Table, the central most Sacrament of the Church, the Eucharist, is offered. The second thing you will notice is the icon screen (called the “iconostas” or “iconostasis”), which separates the altar from the nave. On this screen, you will see icons of Christ, the Mother of God (called “Theotokos” or “Panagia” in Orthodox tradition), our patron St. Alexander Nevsky, and several other saints. Much has been written about this screen and the separation it causes; some view this separation as a barrier to prayer. In the Orthodox tradition, however, it is generally not understood in this way. Rather, the iconostasis makes “visible” that which would remain invisible even if the screen were to be removed. Since, as created beings, we cannot cross the gulf between creature and Creator, we must rely on a negative (or “apophatic”) theology that recognizes and affirms this inability to positively disclose God’s being. Much like Elijah on Mount Horeb, we are brought to recognize that there are aspects of God that we cannot see face-to-face. We can experience His presence, however – His divine “energies” – and it is this experience that the iconostasis seeks to foster by directing our focus and attention. At the center of the iconostas are the Holy or Royal Doors, which are opened during the celebration of the Divine Liturgy and at other times when the clergy enter the altar area. Immediately beyond these doors stands the Altar Table, on which are placed the Holy Gospel, the Hand- Cross, and the Tabernacle. It is worth noting that the presence of the Holy Gospel on the Altar Table is not simply for convenience, as the Gospel is read during the Liturgy: its presence on the Altar Table illustrates our understanding that, although all can read the Gospel privately, it is only in the Church’s reading and proclamation of this good news that its true meaning and interpretation can be found. The Liturgy, then, forms the context in which the Gospel – and, by extension, all of Holy Scripture – finds its place as part of Holy Tradition, and is not separate or opposed to it. The iconostasis and all of the icons in the church form a theological mosaic of sorts. With the hymnography, liturgical music, bells, vestments, church architecture, and all of our liturgical arts, these creaturely forms celebrate and communicate God’s entrance into the “flesh” of our world. Upon entering the church, Orthodox Christians usually pause in the narthex to purchase a candle and to list the names of their friends and relatives, both living and deceased, whom they wish to have commemorated at the service. Then they will enter the nave and proceed to venerate the icons that are held on icon stands, called “analogion” or “analoi” stands. These are narrow, chest-high wooden stands on which smaller icons of Christ, the Theotokos, and various saints rest, to the right and left of the iconostasis. 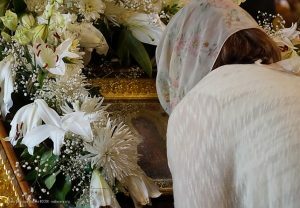 To venerate an icon means to cross oneself and bow before the icon, twice, then to reverentially kiss the icon, and then to cross oneself and bow a third time. It is customary to venerate each icon, starting on the right side of the nave, and slowly moving from icon to icon across the church to end on the left side. It is not customary in our church to approach and venerate the icons that are on the iconostasis or the frescoes painted on the walls. One of the first things that may strike you during our services is the language. 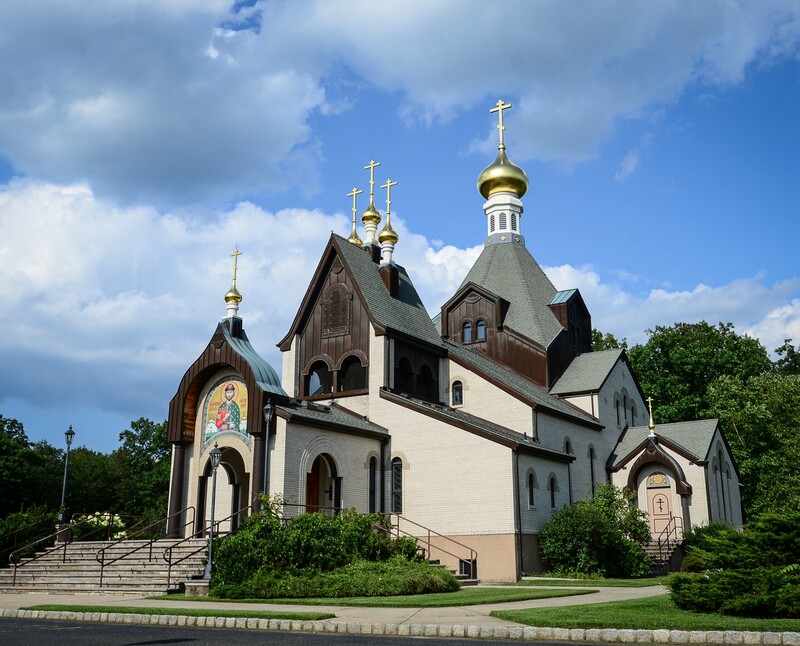 The divine services at St. Alexander’s are solemnly carried out in Church Slavonic (an ancient form of Russian which is used in the Russian, Ukrainian, Serbian, Bulgarian, and other Orthodox Churches, similar – though not identical – to the use of Latin by Catholics) and English. 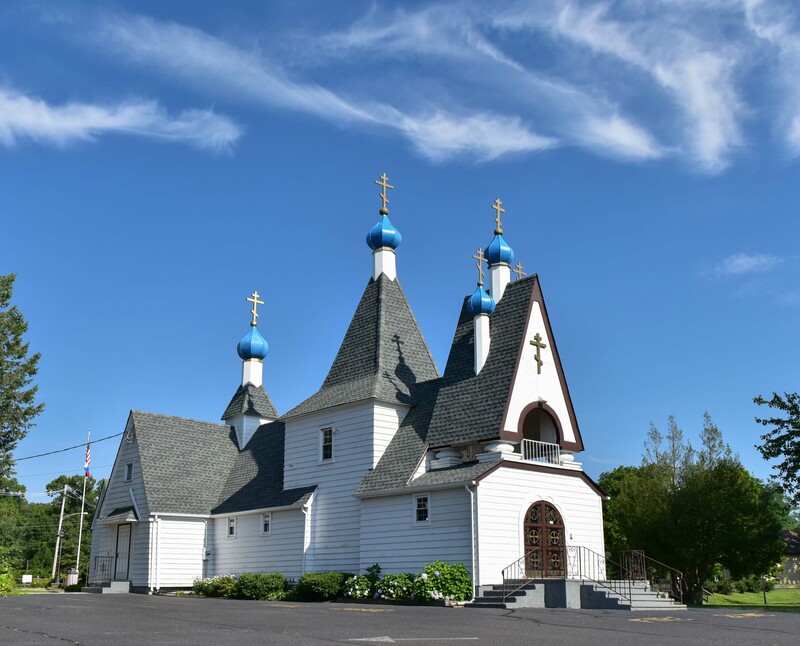 We try very hard to preserve our cultural heritage through the use of Church Slavonic, but understand that there is a growing number of non-Russian speakers in the parish. For this reason, we try to perform the services bilingually, so that everyone can experience the beauty and fullness of our Orthodox Faith. 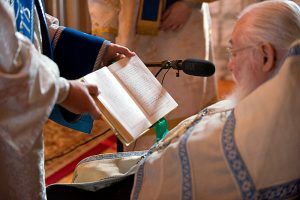 English translations of the Divine Liturgy are available for complimentary use during the services, so just ask one of our friendly staff at the candle counter. If you would like more comprehensive translations of any particular service, please do not hesitate to ask one of the clergy, and they will always be more than happy to assist you. We do not want anyone to feel alienated because they cannot understand the service. As noted above, Orthodox Christians have a great love and respect for the church building, and as a result, when they enter a church, their conduct and dress typically reflect that love and respect. During liturgical services and except at certain times, such as during a sermon or while announcements are made following the Liturgy, those gathered will usually stand and not sit. Standing for prayer may strike Western Christians as peculiar, since in the Western tradition, Christians often sit or kneel to pray. But in thinking about it, even in conventional life we will often stand when we are engaged in any serious activity. One would never think to sit when in the presence of a King or Queen, for example, so why would we take the liberty of sitting when in the presence of God? Thus, when you visit our church, be prepared to stand during the services, unless you are unable to do so for reasons of health. In this case, you will see that we do have benches along the walls of the nave, and if you need to, you should use them without feeling any embarrassment. 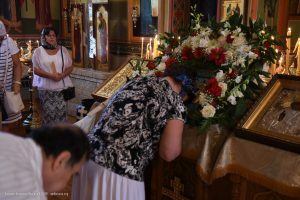 The practice of venerating icons is very old and is central to the piety of Orthodoxy. In the West, this custom may also seem peculiar and, indeed, much attention has been given to the question of whether such veneration is idolatry. However, no Orthodox Christian would ever consider this practice to be a form of idolatry. Icons, like relics of the saints and the Gospel book itself, are always offered for veneration as a sign of the love and respect that we have for God and for His action, His Incarnation, in the created and material world. As a result of His Incarnation, we can picture God; indeed, we are made in His image, and the icons of all of the saints are thus simply images of their participation in the divinized humanity of Christ. They are the signposts along the road of the Christian life, pointing the way for us to go. When we venerate icons of the saints, we prostrate before their earthly struggles that have glorified them in the Heavenly Kingdom, and ask for their intercession before the Lord. Specific prayers in various times of need can be offered to specific saints. For example, St. Nicholas is the patron saint of travelers, and it is customary for Orthodox Christians to pray to him before the start and upon completion of any journey. St. Nektarios of Aegina is the patron saint of cancer patients, St. George the Trophy-Bearer is the patron saint of soldiers, and so on. 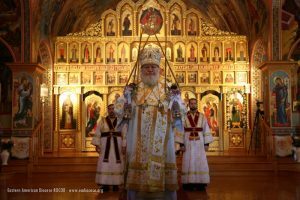 The whole of Orthodox liturgical life – and even life itself – is considered sacramental, in that it can bring one closer to God. 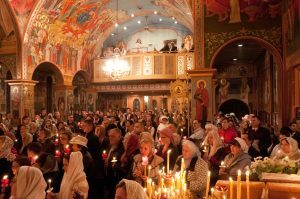 Orthodox Christians celebrate at least seven Sacraments, although even to say so seems to limit the activity of the Holy Spirit in a way that is not fully consonant with Orthodox Tradition. The term “sacrament” is often used to translate what Orthodox prefer to call the Holy Mysteries, which emphasizes the apophatic (unknowable) aspect, as well as the experiential aspect of the Faith. The seven sacraments are Baptism, Chrismation, Confession, the Eucharist, Matrimony (Marriage), Holy Unction, and Ordination. The most important Sacrament in the Orthodox Church is the Holy Eucharist – the simple meal of bread and wine by which we participate in divine life as far as we are able and, by so doing, manifest or reveal the Body of Christ. That is, the Church itself is this Body, and by sharing in this meal, we find ourselves as members of this one Body, of which Christ is the Head. By eating this Food, we discover the true meaning of eating and drinking, not for perpetuation of our biological life, but for communion with God. This Food is called Holy Communion, because in this meal we overcome our isolation as individuals and we “eat” as we would in God’s Kingdom, as Adam and Eve ate in Paradise before the Fall. The eating of this meal is also the means by which we participate most completely in Christ’s Resurrection from the dead. The Holy Eucharist, just as all of the Sacraments of the Orthodox Church, is reserved only for Orthodox Christians. If you are interested in finding out more about the Orthodox Church, please do not hesitate to speak to one of our clergymen. 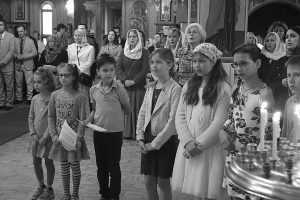 Another characteristic of Orthodox piety is that we tend to feel at home in the church. Because we are comfortable there and familiar, we tend to move about the church somewhat more freely than other Christians may do. This is at least what visitors will most often report, that our worship is not static and mechanical, but that there is movement and perhaps what appears to be disorder. For example, even when entering the church somewhat late for a service (or later than would be ideal), Orthodox Christians will still usually purchase candles, venerate the icons, and put their candles in the candle stands. Sometimes this will occur during the sermon, or even later, for example. Other than highlighting the fact that some do come to church late, which is not a good thing, overall, this freedom of movement seems to be a good thing, as we should be comfortable. However, it is good to refrain from frequent movement, so as not to distract the prayer of those around you. 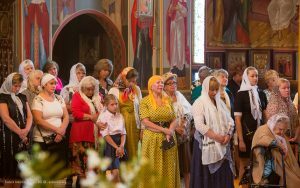 Even though Orthodox Christians feel comfortable in church, they still tend to show respect by the way they dress and how they conduct themselves when they attend services or just enter a church. We generally try to retain the old custom, by which the men and women stand on opposite sides of the church (women on the left, men on the right, as you enter). Women should cover their heads and wear skirts or dresses of at least knee-length. We generally try to avoid wearing anything that is distracting, and this practice applies to both men and women. For example, we would avoid wearing clothing that is revealing, distracting, or too casual: we try to wear clothing that is dignified and shows respect toward God. We do not wear revealing clothes, shorts, clothes that have words or logos emblazoned on them, sports uniforms, bathing attire, anything that is likely to catch someone’s attention and distract them from prayer. So, if you wouldn’t wear it to a business meeting, you can pretty much be sure that you shouldn’t wear it to church, either. However, it is important to understand that our external appearance is secondary when we come before the Lord. It is far more important to come to church with an open and penitent heart than in proper attire. But ladies, please do not be offended or alarmed if you come to church in pants and someone offers you a skirt to wrap around your waist. While we do not approve of this type of behavior, it is not always possible to avoid it in all circumstances, so please rest assured that the person making the offer does not mean to offend you. In line with showing respect and not causing distraction, we try to avoid unnecessary conversation in church. There is a balance here and, frankly, it is difficult to achieve. We are not expected to be stone-faced and absolutely silent when in church. As we see those we know, the demands of Christian fellowship require that we greet each other in joy. At the same time, we do not need to extend these greetings into long, laborious accounts of what is going on at home, at the job, etc., or for telling jokes or slapping each other on the back. For that, there is a time and place in the refectory following the Liturgy. That fellowship is genuine and wholesome, but it is just not at place in the church proper, and especially not right before, during, or after a service has been celebrated. At St. Alexander’s, we greatly value the sense of brotherliness and fellowship among our parishioners. In an effort to foster and promote more interaction between the clergy, parishioners, and visitors, the lower hall of the cathedral has been outfitted with a café and bookstore. A full lunch is served for the community after Sunday liturgy. Nevsky’s Books offers a full inventory of spiritual literature, icons, crosses, gifts, and liturgical supplies. Online shopping at the bookstore is available at bookstore.nevskys.com. 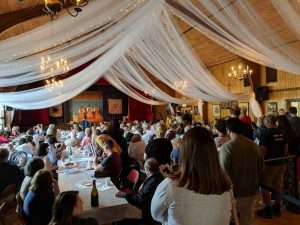 In addition, the St. Alexander Nevsky Foundation was founded to host fundraising events throughout the year, such as a Slavic Festival, traditional Blini and Pelmeni luncheons, and pilgrimages. Information about past and upcoming events can be found on our homepage. 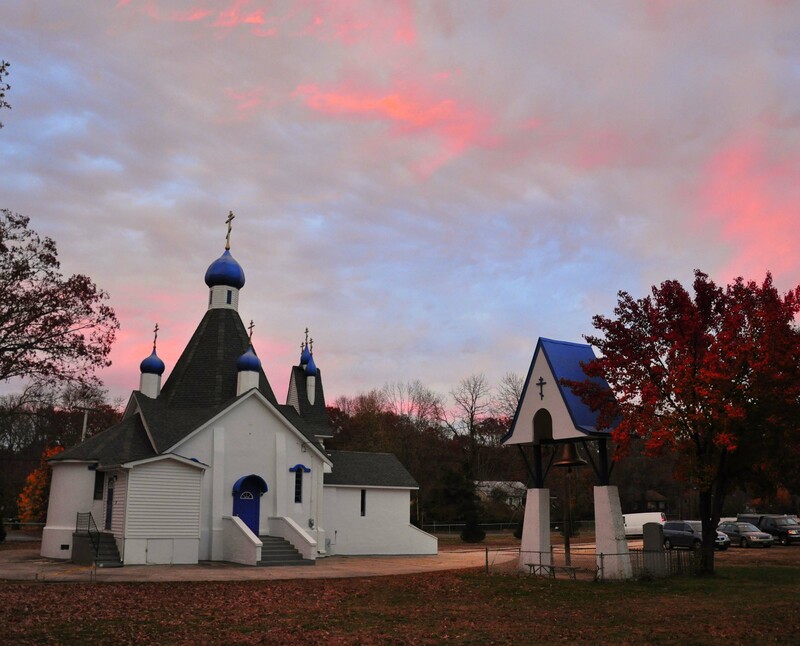 All are welcome to join our Orthodox community! 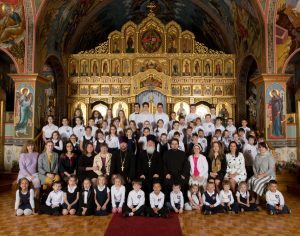 Children are just as much a part of Orthodox worship as adults; in fact, Western Christians may be surprised to see that Orthodox Christians of all ages, even newborn infants, receive Holy Communion. Here at St. Alexander’s, we greatly value and cherish our youngest parishioners and visitors, who are the future of the Church. In an effort to make it easier for parents to attend the divine services, a children’s room is located in the lower hall of the cathedral and is open to all. If your child needs to take a break from the service, feel free to go downstairs and let them release some energy. Audio of the service is played through speakers in the children’s room, and we are working on installing a live video feed of the services, as well.